Bonjour! 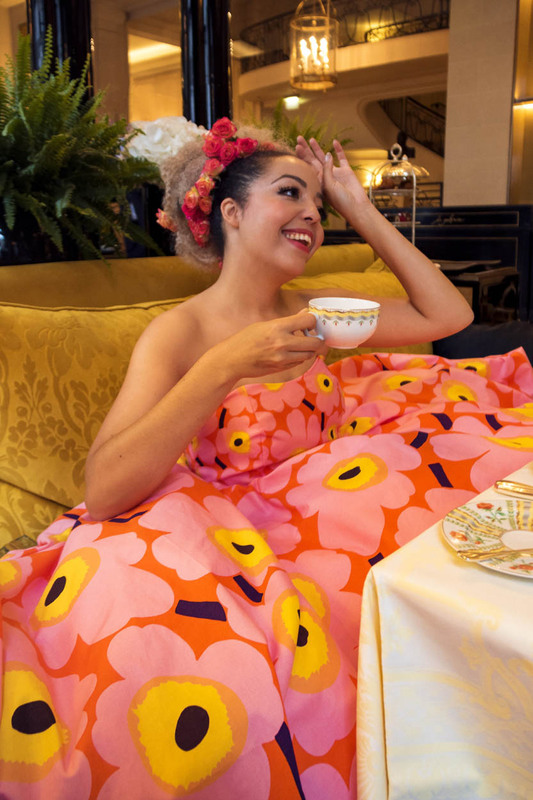 Alexandra and I decided to spend Fashion Week in Paris celebrating my 25th birthday and also taking epic pictures with a custom-made Marimekko dress! About a year ago we had the first idea go to have a photoshoot in Paris. As my birthday was coming we decided to book Norwegian flights and just go for it. The dress got ready the last night before we left and everything was ready for an adventure! Note: this is not a paid ad - just some magical moments with the epic print and celebrating colors and Finnish design. As we are both half Finnish we feel strongly that Finnish brands should be more bold, colorful and international. Finland is the “strange” Nordic country with sauna, Moomins, heavy music, salmiakki and so on. The problem in Finland is that it has always been seen as the lesser version of Sweden and we believe that if we continue trying to be as black and white Nordic as they are — we will always be seen as the runner-up. Finland is full of colors, colorful brands, and ideas. This Marimekko print that Alex wears is designed in the year 1964. So we have some history of bold colors and fun even that so many try to promote Finland as a grey country with a black and white design. Let’s start our colorful journey at the Pullman hotel Tour Eiffel! The wonderful hotel hospitality manager spotted us with the dress and we kindly asked to get access to the rooftop - and they were right away fulfilling our dreams! 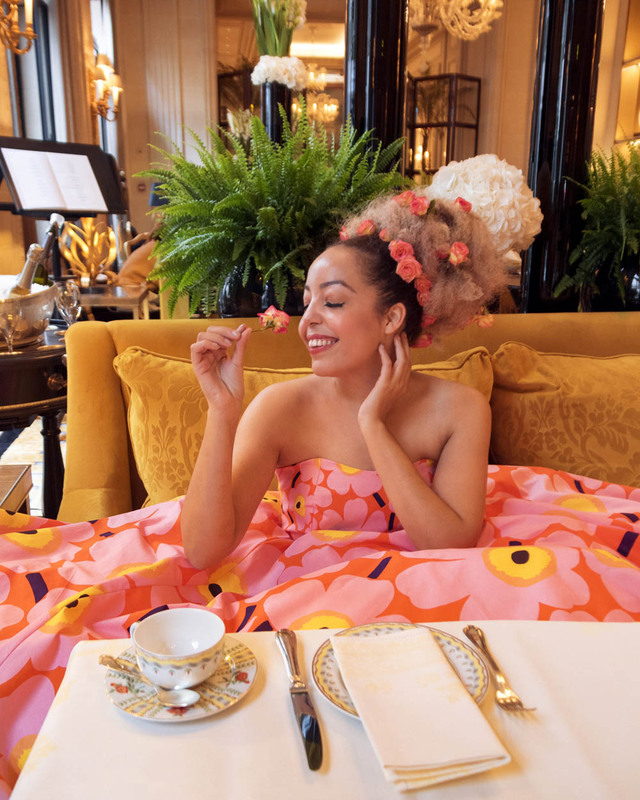 It is said to be the best Afternoon Tea in Paris by bloggers and other influencers and I can agree! We had a really special time and we made all hotel guests really happy with the dress haha. They have also a wonderful Instagram. When we stepped out from taxi - people started immediately taking pictures of Alex! Everyone from old ladies to children were amazed and happy to see this dress. Soon we found us in a situation where everyone stopped Alexandra to take pictures with her and asking our contact information. We felt that no other dress we had with us were as magical, but decided to try one at the Montmartre hill! We woke up super early and were lucky enough to get there before everyone else. The weather was perfect because it weren’t sunny so the tourists didn’t get up so early and we had all the space to ourselfs. Behind these me taking pictures everyone were taking IG stories and pictures of Alex dancing around - because everyone else had a boring grey/beige outfits on even that it was Paris Fashion week. Perfect morning light, Marimekko dress and sunny Alex - what more you can ask? 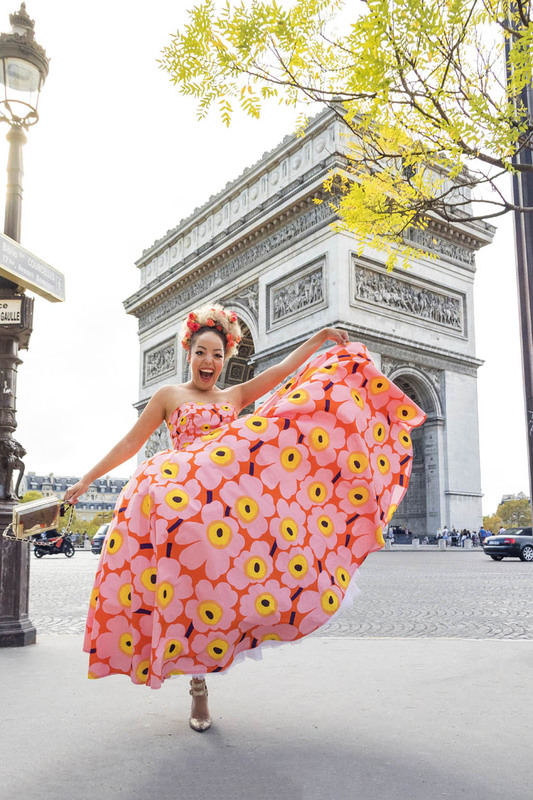 Next Spring we will be creating a bigger even more fabulous colorful campaign in Paris and other European destinations. The campaign will feature known Finnish fashion brands as well as other exciting Finnish companies. We are so excited to already be planning this and cannot wait until we get to share this colorful journey with you! I hope you enjoyed our photo journey in Paris and see you on my Instagram!